SHORT & SWEET: A Bright Cake! A bright cake was ordered and so here is the result. Lots of bright with spots, bows and gerberas. 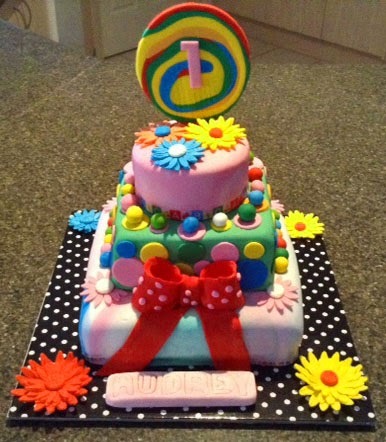 Oh and a lollypop adorns the top of the cake. The client baked the cake (economic) and I provided the "glorification"
The cake is to celebrate the birthday (number One) of Audrey and is to be held in the Botanic Gardens in Albury. Expected temp 40 degrees +.